Well before my first child was ever born, I’d already jumped on the “Elf on the Shelf” bandwagon. I’d seen a co-worker bring one in and I thought, “what a marvelous idea! I wish we’d had something like this when I was a kid.” I wanted to purchase one terribly, but I didn’t have a child to give one to. When I became pregnant with Davey, Elf on the Shelf was one of the first things I wanted to purchase. My sister-in-law beat me to the punch, having purchased one for me, her mom, and herself (in order for Davey to really buy into this, we had to prove that the elf really was everywhere he would be). Davey was 3 months old for his first Christmas, so I packed up the Elf on the Shelf and decided I would wait a few years to pull him back out. 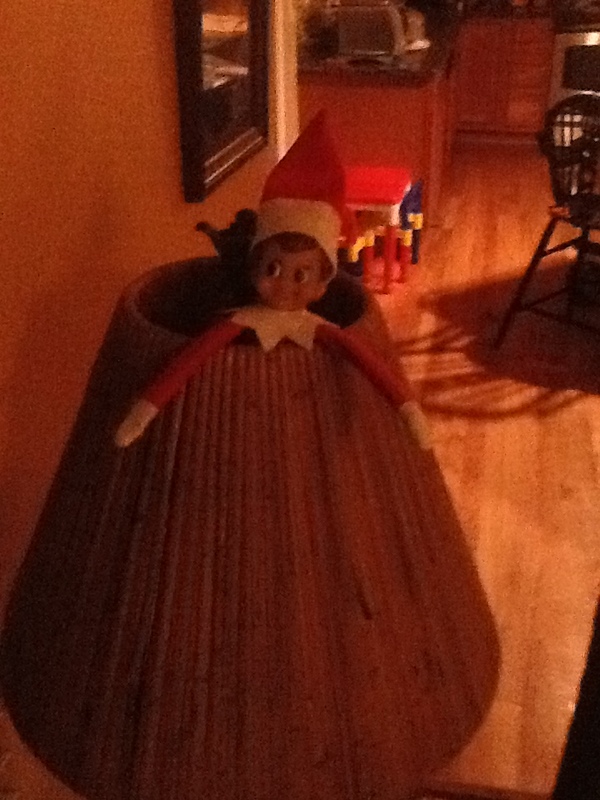 Santa Elf Davey hanging out in the lamp. Davey is now 3 and in preschool. He’s a lover of books, all books, any books, every book (makes this book loving mama happy), so I thought why not dust off the Elf on the Shelf and read the story. Plus, with the addition of a walking Henry, Davey is becoming a little naughty and territorial. I needed something to help keep him in line. I told Davey a little bit about the elf, I read him the book, and told him we needed to come up with a name. I assumed the name would be Jasper, just because Davey’s grandfather calls him that (no clue why) and Davey must name everything else “Jasper”. This didn’t happen. Davey wanted to name him “Santa Elf Davey”, not just “Davey”, but we MUST say the entire name, otherwise he starts having a stage 5 meltdown and the toxic radiation from one of those could compete with Chernobyl. That first day, Santa Elf Davey hung out in our Christmas tree. He was high enough up for Davey not to touch him, after all Santa Elf Davey could lose his “magic” if Davey touches him, and Santa Elf Davey had the perfect view of the room. All the better to see you with, my dear. 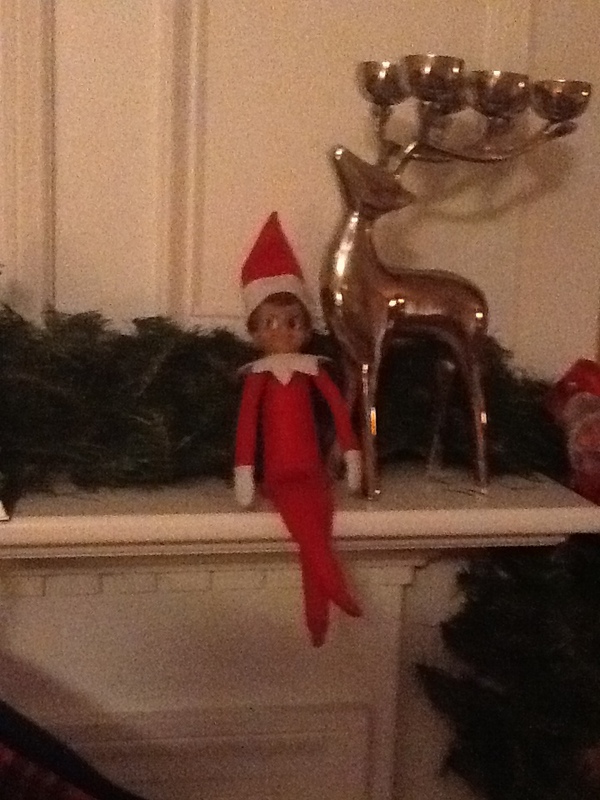 Which leads me to the “creepy” factor of this elf “watching” my child. 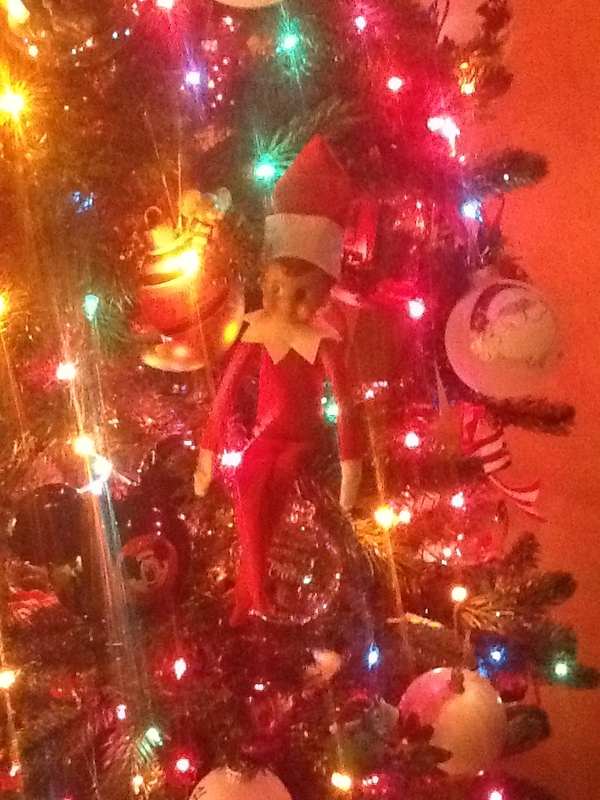 Truthfully, the elf creeps me out more than he does Davey. Santa Elf Davey on the mantle. For years, I’ve watched Pinterest and Facebook feeds. I’ve seen pictures and read blogs about how all these wonderful moms (not me) find creative ways to place their elves. Some of them are ridiculous. For example, I’ve seen pictures of some elves who’ve left messes with flour, sugar, and even toothpaste and I’m led to question some of these moms. Don’t you want your child to behave and doesn’t the mess just encourage the same from your child? This morning I read a blog from another mother about her Elf on the Shelf experience and it pushed me to write about my own. Much like Tabatha Kammann from the blog http://kooperscoop.blogspot.com/, I’ve felt the guilt of being a not so clever mom bearing down on my shoulders. I pulled out Santa Elf Davey a week and a half ago. That’s 11 days. And in those 11 days, Santa Elf Davey has only moved from his spot 5 times and they haven’t exactly been clever. This has prompted Davey to inquire about just how authentic Santa Elf Davey really is, after all the story does state that he will be in a different spot each morning. I haven’t exactly been following through on my end. Santa Elf Davey in his original spot. There’s a lot of unnecessary pressure with Elf on the Shelf, thanks to all you Overachieving Moms. I struggle just to remember to brush my teeth in the mornings, so how could you possibly expect me to remember to move Santa Elf Davey? When you have a moment, check out Tabatha’s blog.